Great video made by Nike. 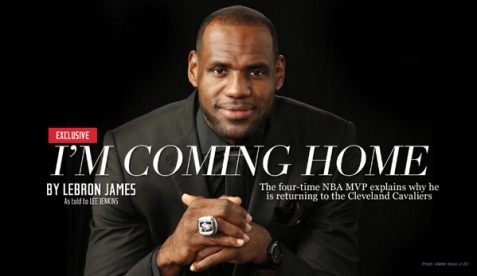 Lebron James has decided to leave The Miami Heat and go back to The Cleveland Cavaliers. Here is the letter he wrote in Sports Illustrated that announced his decision. Gabby Douglas made Olympic history and shattered a color barrier Thursday by becoming the first black gymnast to win the all-around gold medal. The 16-year-old beat two Russians and teammate Aly Raisman to take the top medal in her sport. Gabby was so overjoyed and overwhelmed by her victory that she didn’t appear to fathom at first that her trail-blazing triumph has done more than simply guarantee her spot on a Wheaties box. The only other African-American female gymnast to win any individual Olympic medal was Dominique Dawes, who took the bronze for her floor exercise in the 1996 Atlanta games. “She was one of my inspirations and role models growing up,” Gabby said. With her stunning performance Thursday, Gabby capped a meteoric and unprecedented rise in a mostly-white sport by becoming the fourth U.S. gymnast to capture the all-around title — joining the ranks of Mary Lou Retton, Carly Patterson and Nastia Liukin. Gabby, who was nicknamed “The Flying Squirrel” because of her aerial acrobatics on the uneven bars, also became the first American ever to win the team gold and the all-around gold in the same Olympics.